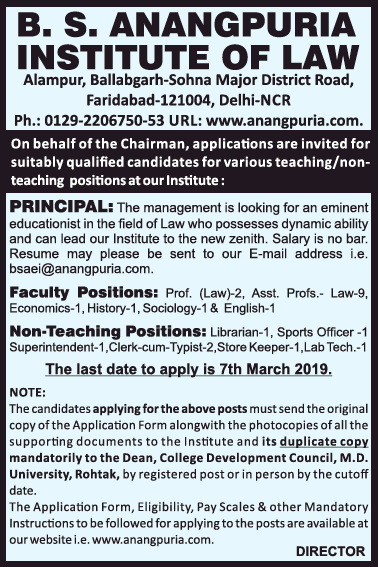 B.S.Anangpuria Institute of Law, Faridabad has advertised in THE TIMES OF INDIA newspaper for the recruitment of Teaching Faculty- Professor / Assistant Professor / Principal Plus Non-Faculty jobs vacancies. Interested and eligible job aspirants are requested to apply on or before 07th March 2019. Check out further more details below. About College: B. S. Anangpuria Institute of Law’ the third proud Institute of BSAEI was established in the year 2007 by our governing Trust i.e. Bhawani Shanker Anangpuria Charitable Trust. The Institute was established with a noble objective to impart legal education which is socially relevant and can promote & uphold the objectives enshrined in the Constitution of India in the present era of Liberalization & globalization.